Audible app comes to Apple Watch for several months, allowing users to listen to audiobooks outside without carrying a big smartphone. While, there is no hint that Audible will arrive at Samsung watch. Although you can listen to audio books on Samsung watches via audiobooks.com app, there is no soup for Audible audiobooks on Samsung Gear S3. Will you consider giving up your Samsung smart watch and purchasing a new Apple Watch 4 Series, only with the purpose to play Audible books when away from your phone? This is not a smart deal. Fortunately, we have thought of an effective alternative way to listen to Audible books on Gear S3 watch by converting Audible files to Samsung watch compatible audio formats. Let's see how it works. With built-in music player, Samsung Gear S3 offers users you to listen to music, playlists from Spotify and other streaming music services directly. But when it comes to Audible books, bad news is that Audible app for Samsung watch is not available currently. As consequence, you can only stream Audible books from your iPhone or Android handsets to Samsung Gear S3 for playback. Besides, you might have consumed that you can access to Audible files on Samsung wearable watch by syncing downloaded audiobooks. As a matter of fact, this is the solution we use to fix this problem. But before doing this, you should be well noted that Audible books are protected by DRM technology, which leading you can't transfer them to Gear watch directly unless you have already converted audiobooks to MP3 with a professional Audible Audiobook Converter. 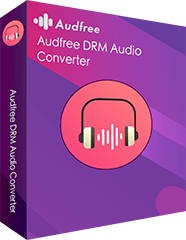 To convert Audible books to Samsung supported audio files, like MP3, here, you can meet AudFree Audible Audiobook Converter, an all-round mighty DRM removal tool for audiobooks. 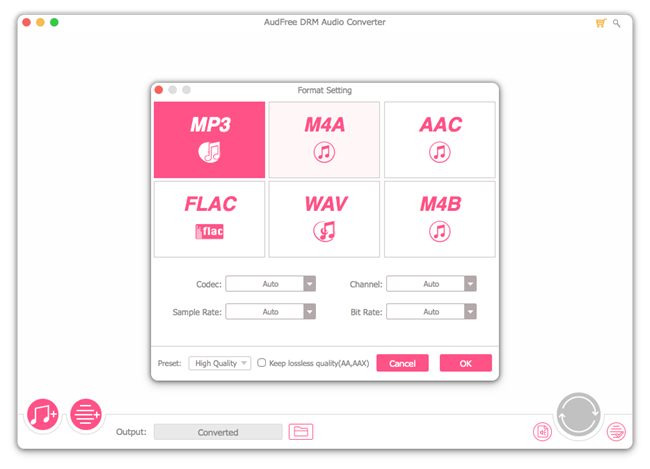 It can remove DRM lock from not only Audible AA/AAX books but also iTunes M4A/M4B audiobooks and convert them to plain audio files, like MP3, FLAC, etc. that can be recognized by Samsung Gear S3. After that you can convert converted Audible MP3 books to Gear watch or other music players and devices for listening without limit. 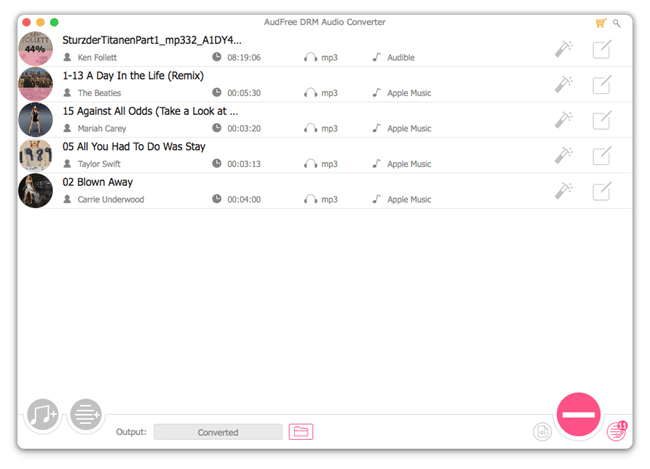 Losslessly convert Audible files to AAC, FLAC, WAV, MP3, etc. The following tutorial aims to guide you on how to use AudFree Audible Book Converter to remove DRM from Audible files and convert them to common files for Samsung Gear S3. So that you can listen to Audible files on Gear wearable watch without carrying phone. When you launch AudFree Audible Audiobook Converter from your computer desktop, you can start to add Audible books to this progream by clicking the first 'Add Files' button to select audiobooks from iTunes library or dragging and dropping downloaded Audible files to the main interface of AudFree. Samsung Gear S3 can support for some common audio formats, like MP3. You can just click the 'audio' icon to open the setting window and directly choose MP3 as output format so that output audio files can play on Samsung device. Besides, you can also customize other audio parameters, like bit rate, sample rate, etc. for better playback. When everything is ready, you can simply press the 'Convert' button to launch the converting process. AudFree Audiobook Converter will begin convert loaded DRM-ed audiobooks into AAC with chapters kept. Wait for a while, you can locate all converted AAC audiobooks in destination folder on your computer by clicking the 'file' icon. Disclaimers: The above tutorial is only available for personal use as it's illegal to remove DRM for commercial use. Please don't share converted audiobooks with others. We just contribute to help audiobook lovers play Audible books on portable devices easily. Congratulations! All unprotected Audible files are saved on your computer and sync them to your phone. After that, you can start to transfer them to Samsung device via Gear app. Let's see the detailed guide as below. Step 1. 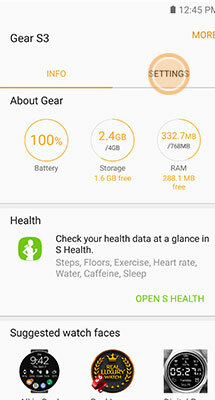 Please install Samsung Gear app on your mobile device and connect your Gear S3 with your smartphone. Step 2. Launch Gear app on your phone and navigate to Setting window to choose Send content to Gear option. Step 3. Now, you need to select the Select tracks to scan music files on your phone and choose converted audiobooks to add. All files will be automatically synced to your Gear. Step 4. You can find out Audible books on Music Player and just click the Play button to listen to audiobooks on Samsung Gear S3 even without phone nearby.